For the past week or two, our almost-three year old has been getting so excited every time the trailer for Brave comes on the television. Hubby decided we would take her to see the movie on Saturday. Figuring the movie would be packed, if not sold out on its second day of release, we opted for Fandango tickets. Since the theater and mall are close to each other, we stopped in at the Disney store to get the little one something Brave themed. She ended up choosing the Merida doll and Angus plush boxed set. The ladies removed the packaging for her, which made it SO much easier on us. We arrived at the movies and allowed her to take in one toy and she chose Merida. Not sure of what to expect with our toddler, she did incredibly well during the movie. She laughed with everyone else and gave the movie her complete attention. We didn't have to warn her or take her out of the theater once. The movie was very entertaining. It had us all laughing and engaged in the well-written story line. I was a little apprehensive at first due to reports from other bloggers that some of the scenes were slightly scary. My child handled them like a champ. She didn't have to cover her eyes or anything. We think it's mainly because she's not in the "monsters under the bed" phase yet. Remember, all kids are different though. Funny, entertaining - loved the characters! Mother & Daughter story line - we all went through some rebellion with our moms and will most likely happen with our own daughters. Learning who they are and them learning who we are. Powerful women - Let's just say when the women asserted themselves, the men listened up. Not your typical princess - No daintiness or pink here! OUR DAUGHTER WILL NOT STOP TALKING ABOUT IT! - That's a home run with any movie! 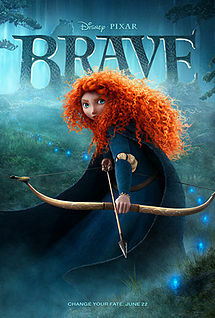 Have you seen BRAVE? What are your thoughts on the movie?